What if America's founding ideals finally became reality? A future of peace, justice, and love comes to life in original speculative stories that challenge oppression and embrace inclusiveness--from N. K. Jemisin, Charles Yu, Jamie Ford, and more. For many Americans, imagining a bright future has always been an act of resistance. 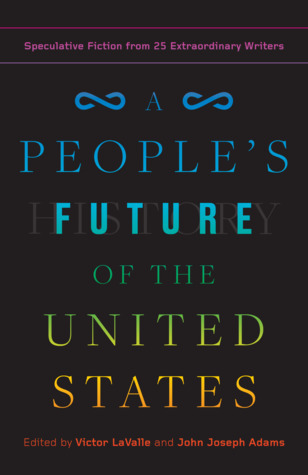 A People's Future of the United States presents twenty-five never-before-published stories by a diverse group of writers, featuring voices both new and well-established. These stories imagine their characters fighting everything from government surveillance, to corporate cities, to climate change disasters, to nuclear wars. But fear not: A People's Future also invites readers into visionary futures in which the country is shaped by justice, equity, and joy. Contributors include: Violet Allen, Charlie Jane Anders, Ashok K. Banker, Tobias S. Buckell, Tananarive Due, Omar El Akkad, Jamie Ford, Maria Dahvana Headley, Hugh Howey, Lizz Huerta, Justina Ireland, N. K. Jemisin, Alice Sola Kim, Seanan McGuire, Sam J. Miller, Daniel José Older, Malka Older, Gabby Rivera, A. Merc Rustad, Kai Cheng Thom, Catherynne M. Valente, Daniel H. Wilson, G. Willow Wilson, and Charles Yu.